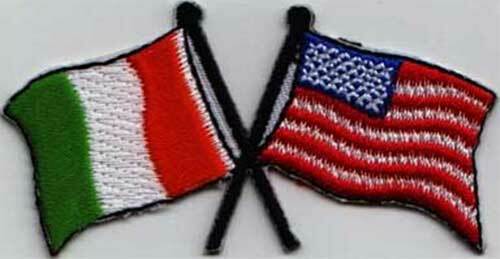 Irish patch features embroidered crossed Irish and American flags. This Irish patch features crossed American and Irish flags. The iron on Irish patch from The Irish Gift House is machine embroidered in Scotland and measures 3" wide x 1 5/8" tall. Irish patch is a shield shaped design that features the Irish flag with a shamrock. Irish patch features a shield with the four provinces of Ireland. Irish patch features the Erin Go Bragh Irish flag. Irish patch is an iron on design that features the tricolor flag.